This sponged gradient look was created using two I Love Nail Polish holographic polishes. A.C. Slater is the darker shade here. It was created to be reminiscent of the original bad boy, OPI My Private Jet. 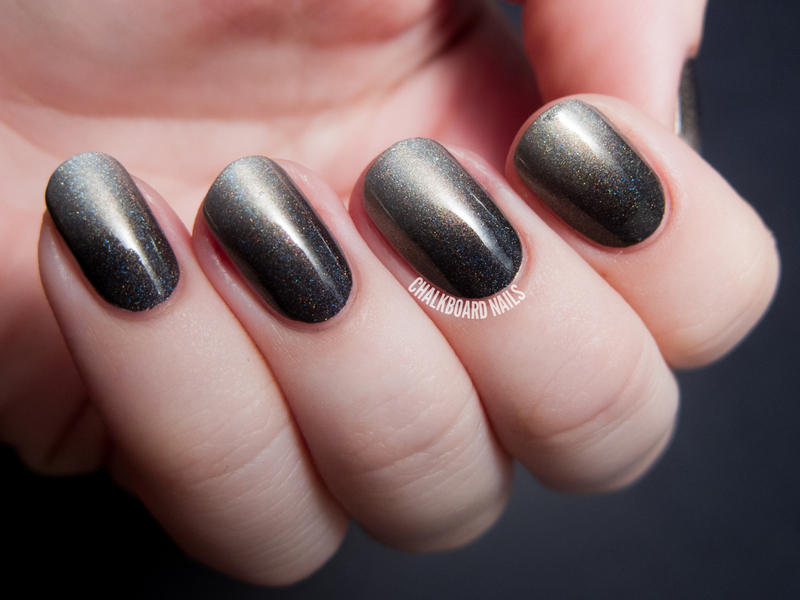 I've worn this gorgeous slate grey alone before and it needed two coats for opacity. It's doesn't have the strongest holo effect in the world, but I actually prefer holos like this because I think they look better indoors. Definitely a beautiful shade. Bottle Service is the lighter shade here. This polish is pretty complex; it has a golden glow hidden inside the grey, which can make this shade look more champagne depending on the lighting. The holographic strength is comparable to A.C. Slater. Applying this polish alone may result in a couple of brushstrokes, but they are minimal. The gold shimmer in the base of Bottle Service took it from "just friends" to "in a relationship," for me. As I mentioned, the holo effect on these shades is not the most intense I've seen, but that translates to a manicure that looks great, even in indoor lighting. It has a smooth, brushed metal finish that isn't disrupted by the holographic particles. I recently switched to a new doctor's office and when I was in for an appointment yesterday, the staff loved this gradient manicure. The dark to light contrast is really eye catching, even from a distance. 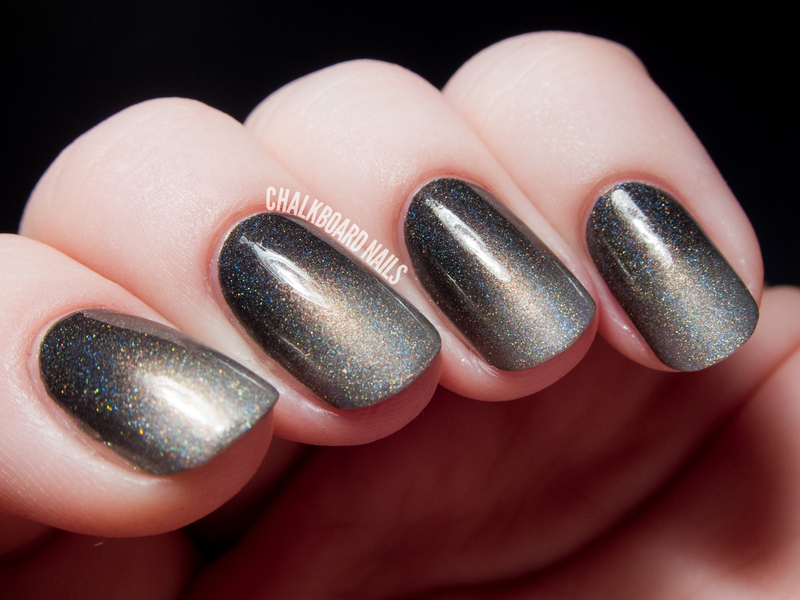 What do you think, do you like smoky holographic shades or do you prefer yours in jewel tones? I Love Nail Polish products are sold on www.ilnp.com. You can also keep up with the brand on Facebook, Twitter, and Instagram. That is a gorgeous manicure! It looks awesome, the shades really flow into each other very well. such a great combo! gorgeous! Love this gradient and ILNP and your new curves! This is awesome and so gorgeous! I love how you did this. Gorgeous!! I really really love this! I love how soft and blended this looks! I LOVE this. I've only done a few gradients, but I have similar holos I could use to recreate it. This holographic gradiënt looks soo beautiful! Amazing! Not complicated but still a super powerful look and the gradient is perfect, almost like it's an illusion of how the light is hitting your nails. Love it! Wow, it's amazing! The gradient is so smooth, and the holo effect wonderful. So gorgeous! Do you have a gradient tutorial? Yours are so nice! Wow its blended so well I thought it was one polish. Good job! I've been feeling it for the neutrals and even warm tones. This fall/winter has been so much about blues and purples-- so read for this. This is just flat out gorgeous, love love love it!!! Holly Smokes! This is pretty impressing! First time hearing of I Love Nail Polish. I'll definitely check their products out!! Oh my goodness.. This is super pretty!! I did Bottle Service first -- I always find it easier to sponge a darker color over a lighter color. I've been a huge fan for of your nail world about 2 years now, yet I've never left comments before. I LOVE these nails! So beautiful! I admire of your gradient nails. They look always very flawless! Are you planing to do a gradient nails tutorial any time in the near future? I definitely have intentions to! Not sure when in the near future that will be, though. Haha, I laughed. A.C. Slater, now that brings back some memories. Wow... this gradient is perfect! this is a really nice nail design. The gradient looks perfect and the holo polishes are simply amazing! I would be happy to see you there.